Birthdays are sort of a big deal at our house. I think that every new year should be celebrated and that everyone should have a birthday cake. My husband, Wes, is not really a birthday cake kind of guy. He loves peanut butter pie. That is usually what I make him, but this year, I took peanut butter pie to a whole new level. When you have a few basic recipes under your belt, you can take those tried and true recipes, and make them into other things. That is exactly what I did here. I used Beatty’s chocolate cake, chocolate butter cream, and peanut butter pie and made them into something new and different. I made Beatty’s chocolate cake exactly as written. I used melted milk chocolate in place of cocoa in the chocolate buttercream and made it into milk chocolate buttercream. I made a half recipe of the filling for my peanut butter pie and put it in between the layers of the cake. A generous sprinkling of sea salt and this is one of the best cakes I have ever made in my entire life. And the most fattening. It is a birthday, who cares? edited to add – I have gotten a lot of question about the bread on the cake. I am going to share with you one of the coolest tips I have. My mom taught me this years ago, and most people who come to my house and see it, do not believe that it works, but it does. I baked these cake layers the night before I was putting my cake together. I left them out on the counter with a slice of bread on top so that the cake layers would not become stale. The bread becomes hard as a rock, but the cake layers remain moist and as perfect as when I made them. I use this same trick with muffins, cupcakes, anything that I want to leave on the counter. Try it, it really does work. Bake your chocolate cake layers and let cool. If you want to use a boxed chocolate cake mix, I will not tell. Promise. Do as I say, not as I do. My cake had borderline stability issues. I should have either cut the cake layers in half and did the peanut butter filling twice or inserted dowels into the cake to keep upright. Chill the cake for a few hours to make sure everything is nice and firm. 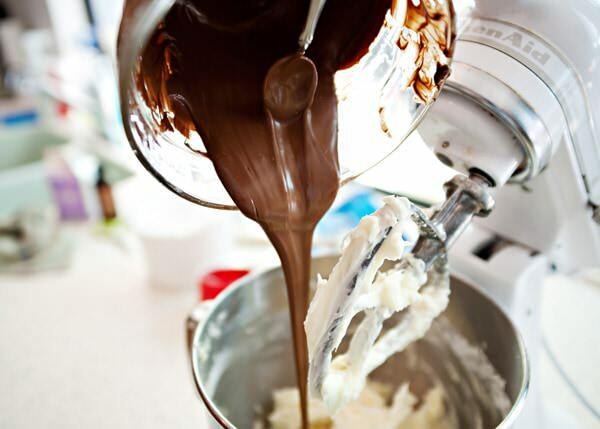 Make the buttercream replacing the cocoa with cooled melted milk chocolate. I want to stick my face in this bowl right about now. 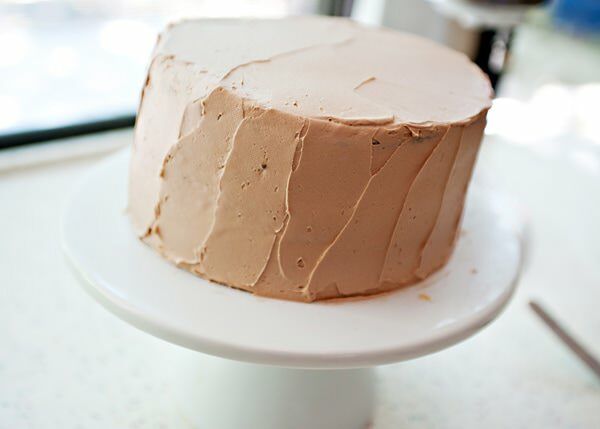 Ice the cake with the milk chocolate buttercream. See how I am leaning? Part of it is camera angle, but part of it is a lopsided cake. 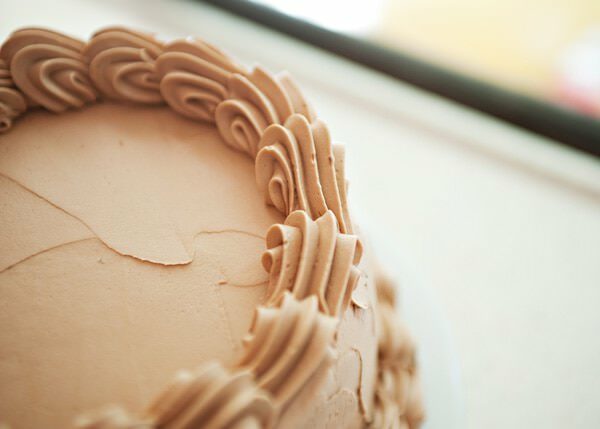 You can make the edges fancy by piping the extra frosting on the edges. 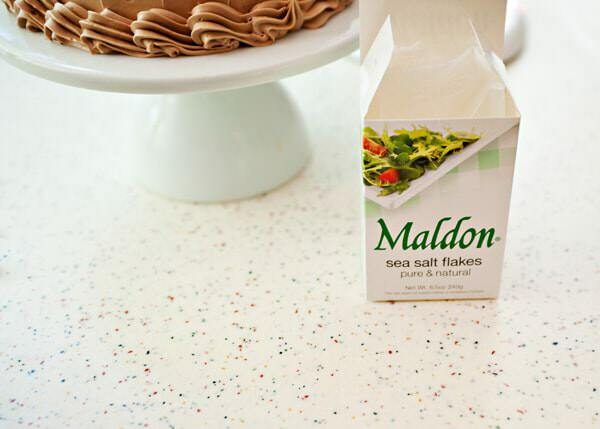 Sprinkle the top with sea salt. It absolutely brings out all of the flavors and it does not make it salty, but more chocolatey and peanut buttery. It makes it even more delicious. As if milk chocolate and peanut really need to taste better. I might also mention that this makes for a pretty perfect after-birthday breakfast. I used Beatty’s chocolate cake, chocolate butter cream, and peanut butter pie and made them into something new and different. I made Beatty’s chocolate cake exactly as written. I used melted milk chocolate in place of cocoa in the chocolate buttercream and made it into milk chocolate buttercream. I made a half recipe of the filling for my peanut butter pie and put it in between the layers of the cake. A generous sprinkling of sea salt and this is one of the best cakes I have ever made in my entire life. I should have either cut the cake layers in half and did the peanut butter filling twice or inserted dowels into the cake to keep upright. Chill the cake for a few hours to make sure everything is nice and firm. 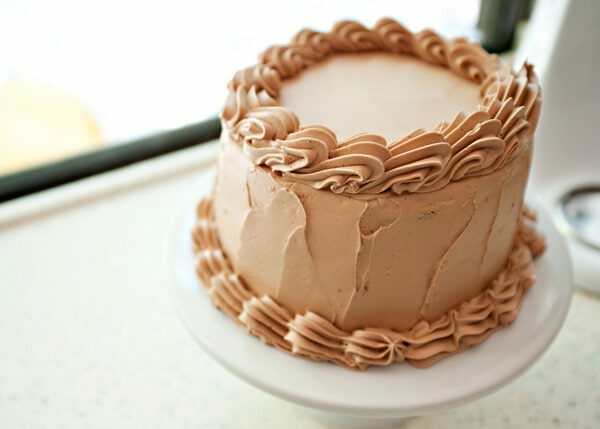 Ice the cake with the milk chocolate buttercream. Sprinkle the top with sea salt. It absolutely brings out all of the flavors and it does not make it salty, but more chocolatey and peanut buttery. .
Great job… it is beautiful! I was going to try the bread trick.. does it matter what type of bread I use? 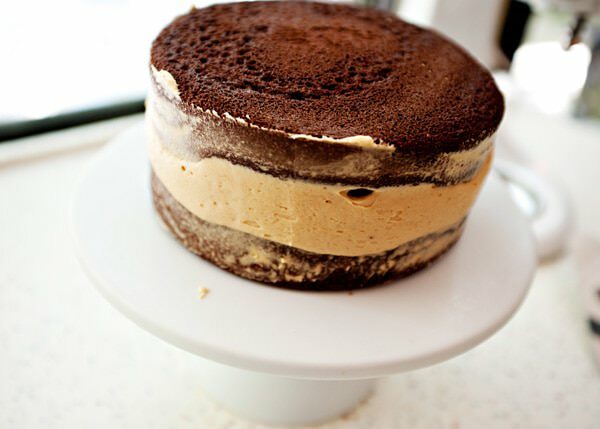 Peanut butter pie combined with chocolate cake? And sea salt?! This might be the greatest thing we’ve ever seen. Lucky lucky Wes…! It was crazy good. The salt is my favorite part. 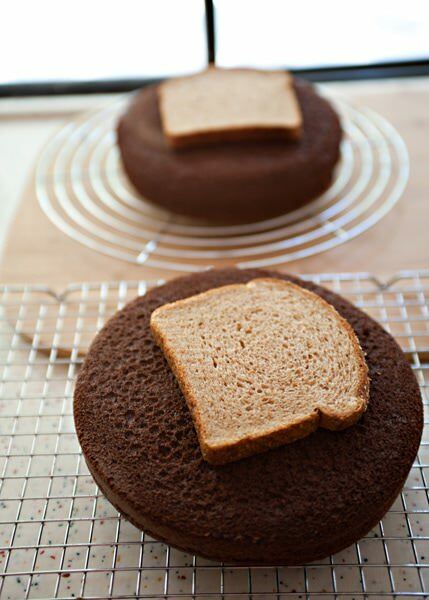 This may be a really stupid question, but why are there pieces of bread on top of your cooling cakes? This looks absolutely to die for – it may have to be my birthday cake! it is pretty yummy. I answered your question, I edited the post. Thank you Amy! I answered your question in the post. This looks DIVINE!! I can’t wait to try it. It is. I hope that you it as much as Wes did. I’m wondering about the bread, too! I love your site and I check it every day even though I hardly ever post a comment! Don’t be so shy! Pop in and say hi! I too have to ask about the bread on top of the cakes. Is this some bakers secret I am not privvy to?? I edited the post to answer you. This looks so good! My husband’s birthday is in December and I am going to have to make this for him! He will love it. Promise. Thanks SO much for sharing the tip about the bread!!! I never ever would have thought to do that. I will definitely try that out!!!!!!! LOL, I can relate when it comes to the leaning cake but it’s beautiful nonetheless. I love the peanut butter and chocolate combo, its a perfect match! Thank you, it looked bad, but tasted delicious. Beautiful cake – and great tip – about the bread! This looks amazing! Similar in concept to Sky High’s Chocolate Cake with Peanut Butter/Cream Cheese Frosting and Chocolate/Peanut Butter Glaze (or some similar longish name), but amazing. What is Sky High chocolate cake? I am going to have to look it up. Looks delicious! Oh and so excited about the bread secret! Now my kitchen won’t be such a mess when everyone comes over! You can do the bread trick with cookies also. We put it in the bag with the sugar cookies we make, and change out the bread every so often. Keeps them fresh! I do it with all the things that I bake. Thanks! My mom taught me. Loved your bread explanation. We do something similar when we store cookies in an airtight container, we put a piece of bread in with them so the cookies stay soft. Never thought of putting the bread on cake, but it probably works just as well! The cake looks soooo delish! Thank you. I do the same thing with brown sugar also. you are welcome. Thank you for loving my leaning cake. Now that is what I call a beautiful, delicious, glorious cake! Divine! Holy Crap Bree, this cake is going to kill me! I love pb and chocolate and desserts with sea salt. My Aunt one a mixer last week and then gave it to me. This cake is my future and destiny. I hope that you like it as much as we did. The salt sends it over the edge. 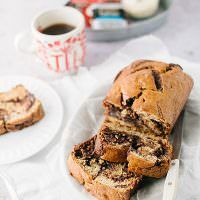 I am drooling….chocolate and peanut butter…Love the bread idea. Interesting because I was wondering about this recently when I made muffin tops. I always let them sit out to cool completely then for storage I put them in a zip loc back but it always ruins them as the nice firm tops get moist and slimy. Is this how you store your muffins as well? If not, how do you store them to keep them so fresh without the moisture? About your salted carmels…how long do they generally keep? a few weeks? If I make them now, still fresh for Thanksgiving give-aways? And the cake…Is the middle that thick?! Yum! Is that why it’s leaning? Yes, that is how I store my muffins. Anything baked gets bread on top. The middle should not be that thick. Lesson learned. I discuss it in the body of the post. Beautiful cake! I’ve had this recipe tucked away for some time now and your beautiful results have inspired me to try it. Thanks for the tip on the bread tric, as well! I always put bread in my cookie tins. It keeps the cookies fresh and moist for several weeks. I switch out the bread when it gets stale. Never thought to use it on cake layers though…great idea. thanks for the tip about the bread in the cookie tins. I never thought to do that! I was just dreaming about this cake so I came over to find it on your blog so I could at least see it. Man, this was an incredible cake. lol… sister friend, I will make you one anytime that you like. Hi! New to your blog. I just had to comment about the bread thing you do – you’re the only other person I’ve seen do this trick, besides my mom. 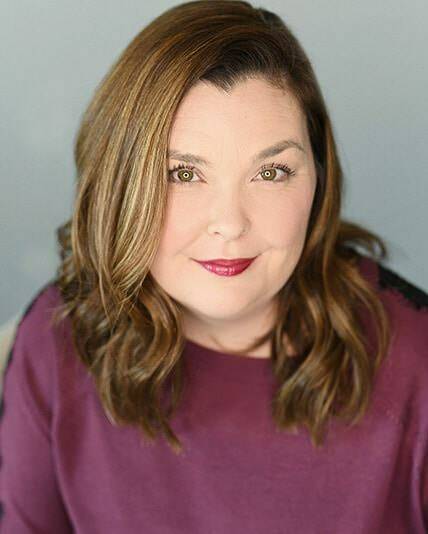 She doesn’t do it for leaving things out over night, but she puts a slice of bread in between layers of cookies (chocolate chip or sugar cookies) in an airtight container – they stay moist for days! Hi Ashley! Welcome. It is the best trick in the world. Works like a charm. I always put my a slice of bread in with my brown sugar to keep it soft, but that’s a great idea to try with cakes and muffins as well! The cake and bread? Do you wrap your cake and slice of bread in anything or just leave it sitting overnight just like the picture with the bread on top? Just like it is at room temperature. The cake looks fab! 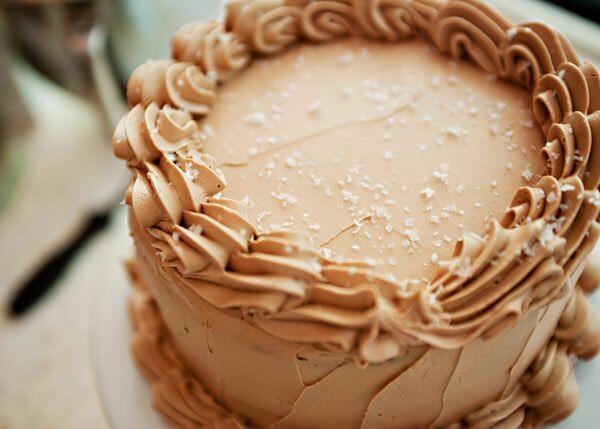 Love the frosting you piped on it. What tip did you use? I love how big the shells are. My bigger problem with leaving anything out in the open is ants….. Is the bread usable after this trick? It bites at me if it has to go into the trash bin thereafter. I use a really large star tip. I am not sure which one exactly. And yes, the bread is completely stale so you cant really use it for anything else. If u really have to use the bread use it for stuffing or croutons! Love this site! The step-by-step instructions with pics awesome! Will the slice of bread work to keep baked goods moist if gluten-free? I really don’t know. You will have to try it out and see. How do you use the bread trick for cupcakes? Same way, I just lay two slices of bread on top. 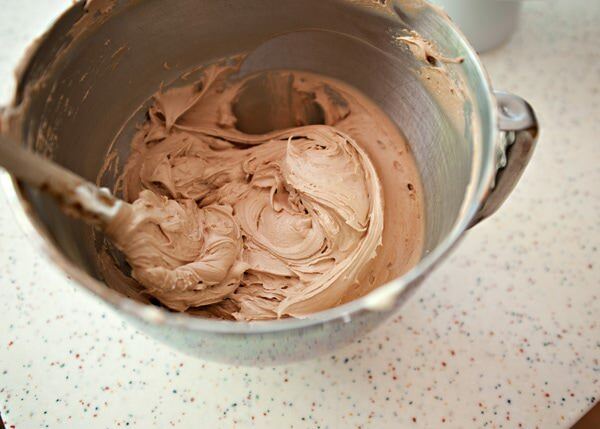 How much melted milk chocolate do you add to the buttercream recipe?? Looks delicious and want to make! Like the recipe says, just replace the 3/4 cup cocoa with 3/4 cup melted chocolate. I think the recipe says 1/2 cup cocoa if I am reading correctly? Should it be 3/4 cup or 1/2 cup? It can be whatever you want it to be. Add as much chocolate until you get the amount of chocolate that you want. The bread thing is funny. I thought I was the only one that did that, it was my little secret, and I learned it worked by accident. I only had a few pieces of bread left when I burnt a hole in the bag, with the hot pan I just pulled out of the oven. I thought putting the bread in the container with the cookies would keep it fresh. the next morning my bread was hard as a rock but the cookies were the moistest I had ever made. my question is why does this work what is the science behind it? anyone know? I’ve been looking it up for awhile and found no explanation yet. I have no idea why it works, I just know that my mom did it, so I do it too. I just did an interview on NPR about this very subject. I know this is over a year and a half old but I can’t thank you enough! I’m not a super skilled baker by any means but I can follow a recipe and LOVE baking things as gifts for people. My mom’s birthday is coming up and the only thing she adores more than peanut butter is peanut butter and chocolate together! LOL. I am glad that you found me! Welcome! Made this today for a birthday party. While the flavor combos are delicious, I had major stability issues. I sliced each cake layer in 2 as recommended, but this filling is not strong enough to support the cake. I also had trouble getting the whipped cream to fold into the peanut butter- the delicate cream couldn’t hold up against the pb. I would make this again but adjust the filling. The idea and flavor combos are great. I wrote about the stability issues and provided ways to fix it. Sorry it didn’t work out for you. This cake is delicious! I threw all the PB filling I’m between and it oozed everywhere. I should have listened to your advice 🙂 good anyway though! You are welcome, it is what my mom always did. I thought that everyone did it! Let me give you a big kiss! Do you have any idea how many nights I’ve stayed up WAY too late just waiting for my baked goods to cool so that I could put them away? You are like my new favorite person! Can’t wait to try the frosting on some brownies i took out of oven. of the bread or bread that is getting a little stale. Thanks for sharing recipe. This looks so amazing!! I am ready to make this for my husband’s birthday! One thing, I cannot have heavy cream (ugh, I know!). Is there an alternative for the peanut butter filling? Or would you suggest another flavor of filling for this cake? I’m in love with the chocolate cake and milk chocolate frosting. I would make a different filling. I don’t think that it would work without the heavy cream. This bread trick also works on sandwiches. If you make them in advance you can place bread on the sandwiches and they will stay soft and moist. Bree, stumbled upon your recipe & will attempt it for my 12 yr old’s Bday. I am by no means a baker, but am usually good with recipes. Almost all cakes can be made ahead of time. I could keep this cake cold. It will set better that way. And there is a lot of cream in the middle. I wouldn’t take any chances. That’s right. I just use the slice of bread, and nothing else. I also do this a cake that has been sliced. I put a piece of bread on the exposed inside of the cake. Works every time.